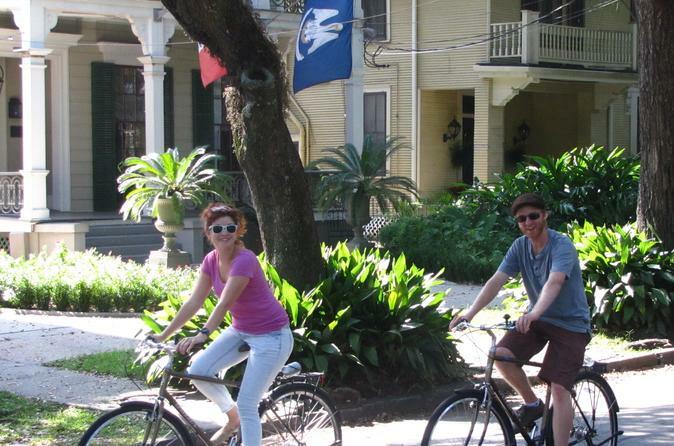 Explore the history-rich neighborhoods of New Orleans on a 3.5-hour bike tour in the morning or afternoon, and see the sights with a local guide! While riding around seven of the city’s most exciting districts, learn about the city’s evolution from a small French colony to a fast-growing commercial center and multicultural hub. Cycle through the French Quarter and bohemian Fabourge Marigny; marvel at millionaires’ mansions on Esplanade Avenue; and pass top New Orleans attractions such as St Louis Cemetery 3, City Park and more. Meet your guide in New Orleans’ French Quarter, listen to a quick safety briefing, put on your helmet, and then set off by your comfortable 3-speed city bike! Pedal behind your guide at a steady pace, enjoying frequent stops to learn about the sights, pose for photos and chat with your guide. Many say that the history of New Orleans can be traced through its neighborhoods, so your tour takes in seven of its most atmospheric boroughs to help you understand the different eras in New Orleans’ development. Cycle along the banks of the Mississippi River where the city was born, wind your way through the French Quarter, and pass in to the bohemian neighborhood of Fabourge Marigny. Get a feel for New Orleans’ 19th-century swagger as you pass along Esplanade Avenue, home to mansions built by the city’s founders. After cruising around the leafy streets of the upmarket neighborhood, take a break in St Louis Cemetery 3 to see its fairgrounds as well as some impressive marble tombs. Wind your way around the landscapes gardens of City Park to start heading back toward the French Quarter, passing through three more exciting city neighborhoods: Bayou St John, Mid-City and Treme. After 3.5 hours of exploring the city and learning about its history, return to the start point where your bike tour finishes.